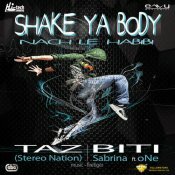 Taz (Stereo Nation) is back with his highly anticipated brand new single entitled “Shake Ya Body (Nach Le Habibi)” featuring Biti, Sabrina, One & Firetiger!! ARE YOU oNe? Contact us to get a featured artist profile page.